Call the Alaska WildBird Rehabilitation Center at 892-2927 for assistance. If your call is not answered, leave a call back number. There are some things you can do while waiting for a call back: If safe to collect the bird, put it in a box or animal kennel of a size so the bird cannot fly around. If the bird is large, or too active to collect, try to keep pets and other animals away from it. Do not attempt to catch an eagle without assistance. Cover the box with a towel to keep the bird quiet. Put the box in a safe, cool, quiet place, away from pets or children. Be sure to notify the AWBRC representative if you need help catching the bird. During the spring and summer, you may find a baby bird. In this case it is important to watch for the parents. 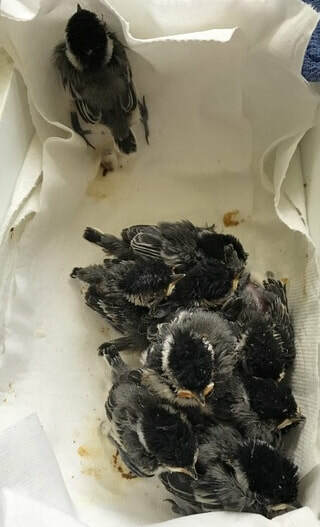 Young birds can fall out of a nest, but will still be cared for by the parents. If you know where the nest is, and it is safe to do so, replace the baby in the nest. It is a fallacy that the parents will ignore the chick if it has the scent of a human. Before proceeding with a rescue, be sure the bird needs to be rescued. Humans will never be able to raise a young bird as well as its own parents. After talking to a representative of the Alaska WildBird Rehabilitation Center, we appreciate if you are able to bring the bird to the Center. Please verify there will be someone available to receive it. We are located at 12235 W. Birch Rd, Houston. From Big Lake Road, go about 1.4 miles and turn onto Kenlar (sign to Houston High School). In another ½ mile or so, turn left on Birch Rd. (sign to Houston Animal Shelter). In a short block on the right you will see our sign. Thank you for caring about the birds!